Springer Controls has partnered with TER of Italy to offer their line of pushbutton stations and pendant controls to the North American market. Springer Controls stocks the parts in the USA to customize and build out the controls for quick shipment. 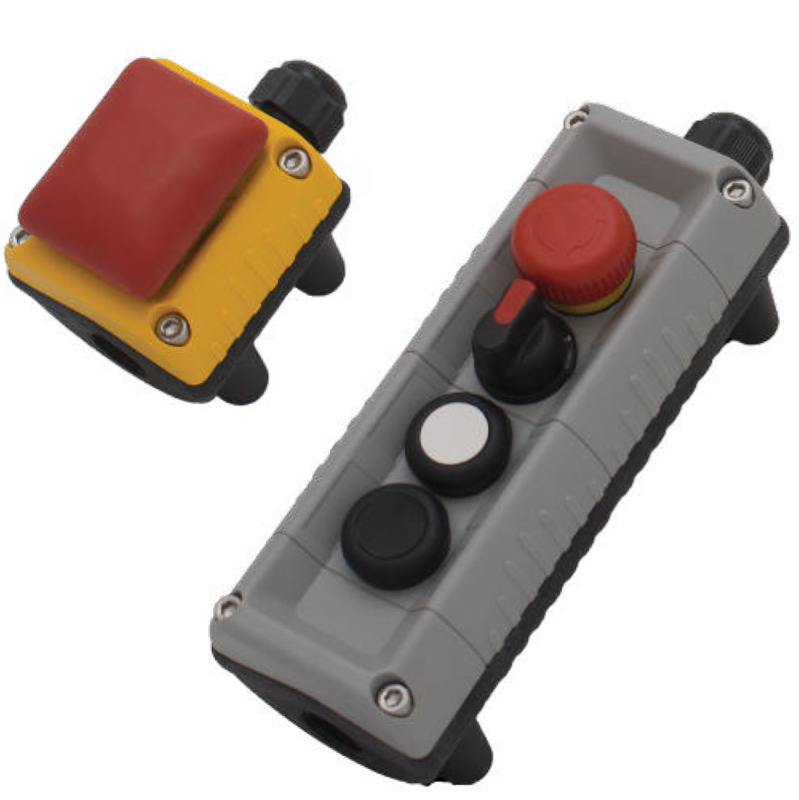 The highly popular Charlie pendant control station has 2-3 positions for buttons, selectors, pilot lights or potentiometers. The compact design has a modern, ergonomic design for single handed thumb operation of the two main control positions. The third position is commonly used for an emergency stop or a selector switch, but can be configured with a pilot light as well. 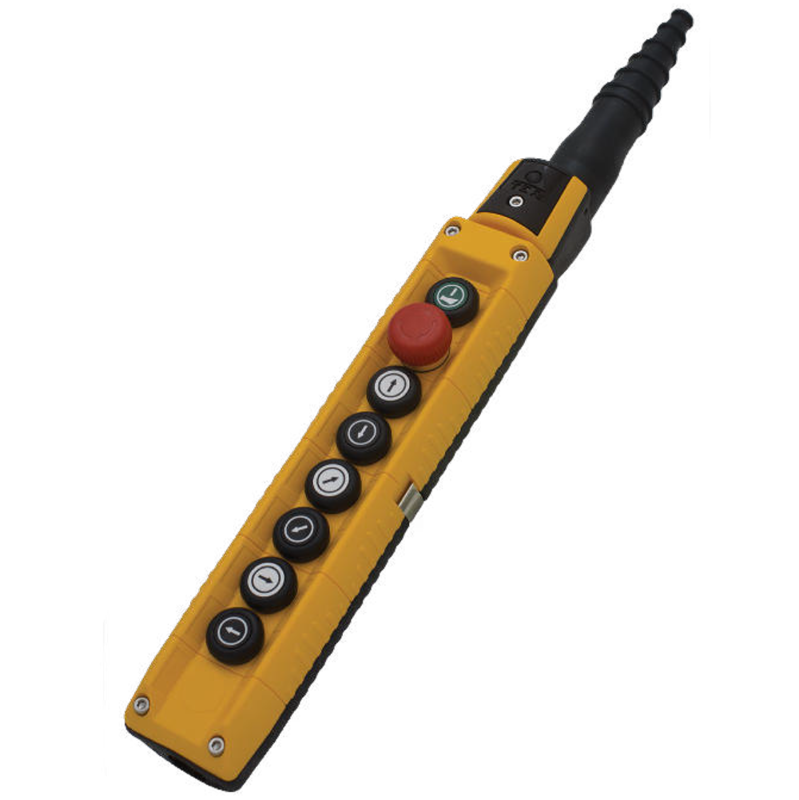 The Mike pendant control station has 4-15 positions for buttons, selectors, pilot lights or potentiometers. The lightweight construction and ergonomic design make it easy to hold in one hand, while operating the controls with the other. 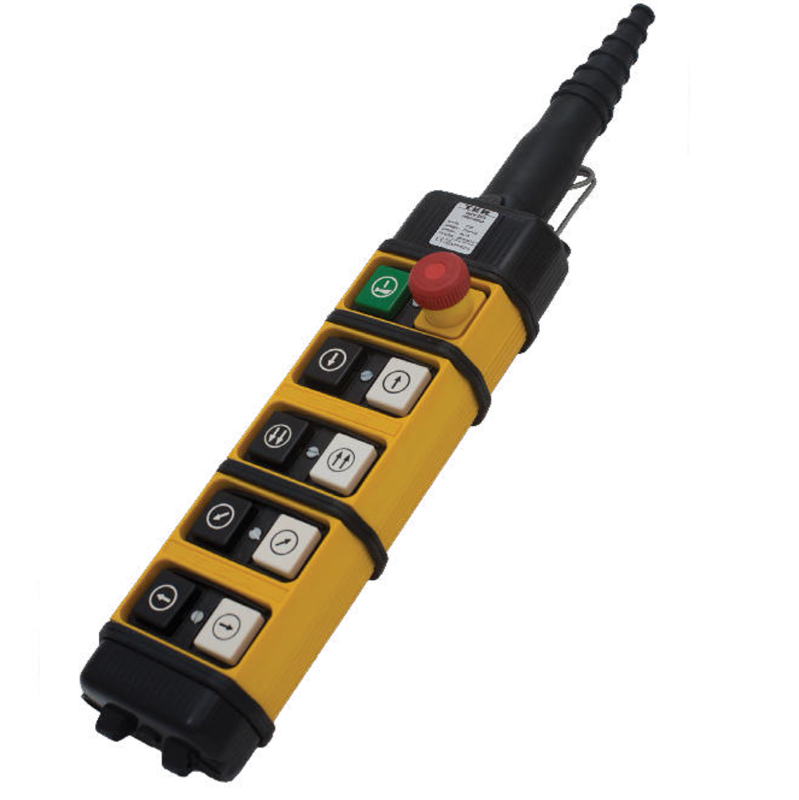 With up to 15 positions for controls or indicators, and a unique position labeling feature which allows the control labels to be placed on the buttons themselves or off to the sides, the Mike can handle the most complicated and diverse control requirements. 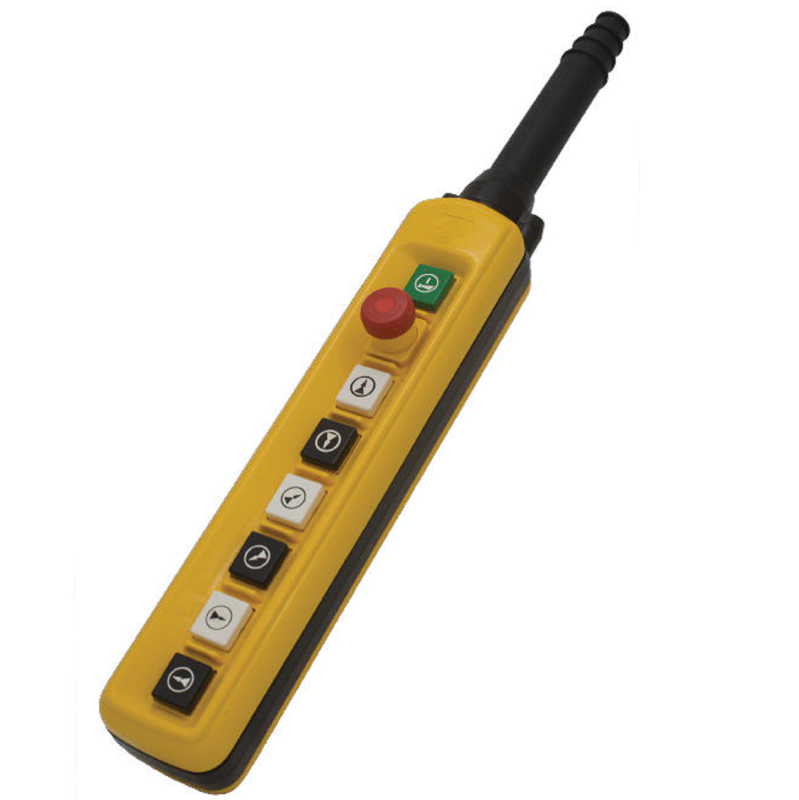 The Alpha pendant control station has a unique 2 column design that contains from 2-13 positions for buttons, selectors, pilot lights or potentiometers. Many customers prefer the two-column design for having up/down or left/right functions next to each other on the control. It can also be used to have a pilot indicator light directly next to the button that controls the on/off function. 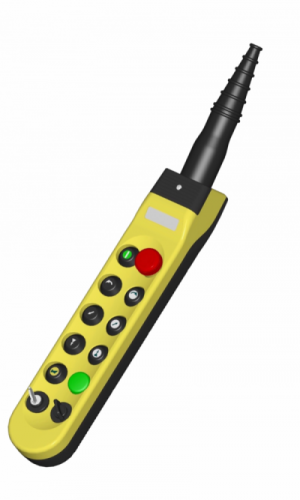 This design makes it very intuitive for the operator and provides a wide range of functions and controls in a compact, ergonomic housing. TER’s well known, classic NPA pendant control station is highly configurable with 2-12 positions for buttons, selectors, pilot lights or potentiometers. 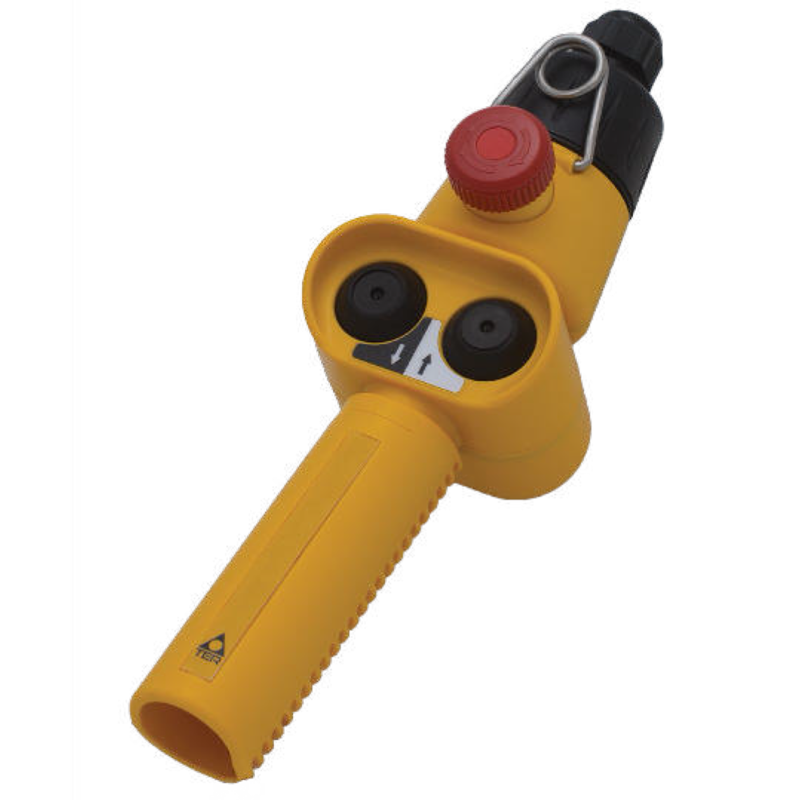 Additionally the cable sleeve can be angled up to 20° to give the operator the best view of the controls and provide a more natural/comfortable working position. The NPA can handle up controls for up to 3 different speeds, with the familiar rectangular push buttons arranged in a single column. 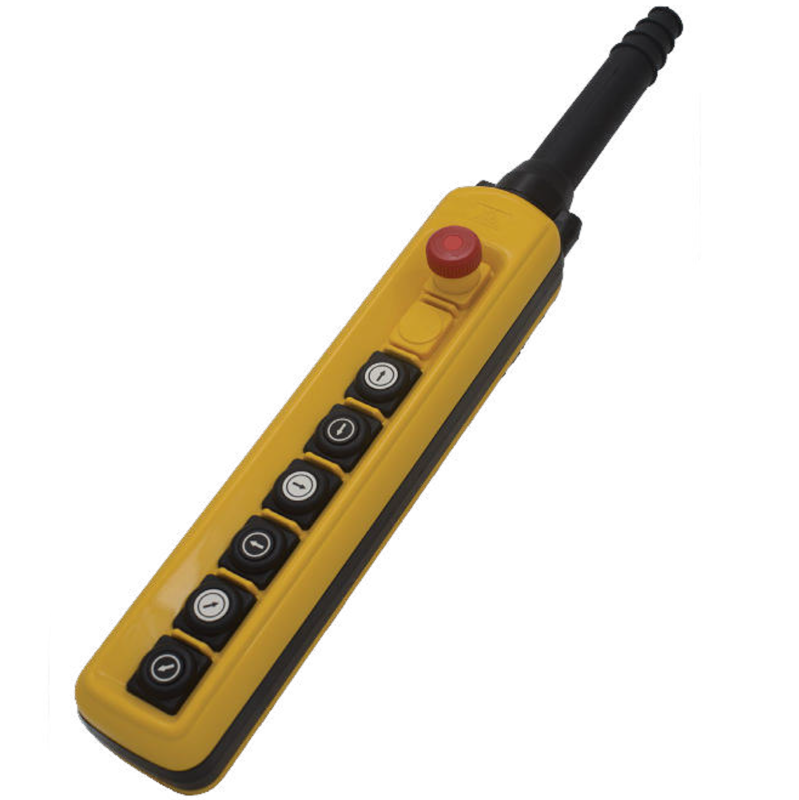 The NPA-CP pendant control station is similar to the NPA, however it includes contacts rated for up to 20A and voltage to 660V which allows for direct control of motors without the use of relays or contactors in the circuit. The NPA-CP has 2-8 positions for buttons, selectors, pilot lights or potentiometers. The reduced number of positions is due to the larger contacts used in the NPA-CP versus the NPA. 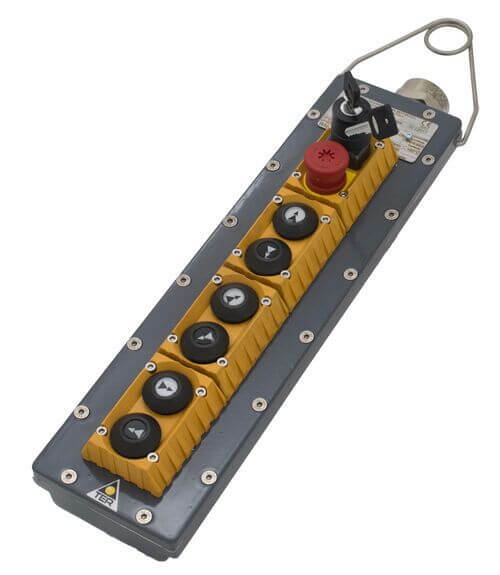 The SPA pendant control station has a modular configuration which allows the same basic design to be used in a compact 2 position arrangement up to a whopping 20 positions for buttons, selectors, pilot lights or potentiometers. The unique two column design allows for having opposite functions (up/down or left/right) paired on a row for intuitive operation. The modular design offers a pendant control station sized specifically for the application requirements while still allowing complete flexibility for expanded controls without changing the basic pendant shape and style. This is a particularly good choice for OEM customers who want to have a familiar pendant style used throughout their product line regardless of the variability in control requirements. The heavy duty design withstands the most rigorous working conditions. The Victor wall mount control station comes in a range of sizes from 1 to 8 positions for buttons, selectors, pilot lights or potentiometers. 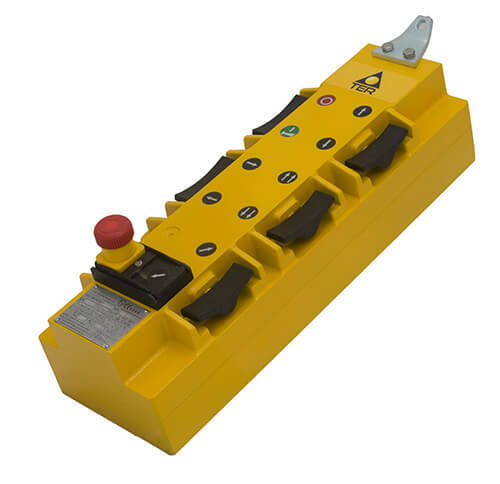 1 button are commonly used for emergency shut off switches, while the 8-position control station offers an immense degree of control and customization for more complicated operations. The Victor can be bolted to a wall or structure, or use our magnetic mount to attach it to a steel structure.